It’s no surprise that there is a consumer-led trend towards healthy food and drinks for children. Latest government statistics indicate that almost a third of children are overweight*. Couple this with another trend: 29% of mothers worked 35 hours a week or more at the end of last year, up from 23% in 1996** and suddenly easy ways to give your children healthy food and drink is a must have. The holy grail is healthy convenient food that still demands the requisite pester power. The usual suspects are making strong head way – baby food, yogurts and juices and ambient drinks, with plenty of NPD in the chilled ready meals category. 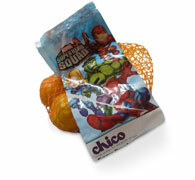 Product developments in fresh fruit (see Marvel/Chico below). Home baking – is not welcoming this trend. How about healthier packet mixes? Flapjacks? Wholemeal muffins? Recipes including one of five a day? Packaged fruit – was surprised to see children orientated packaging in fresh fruit (see below) but not in the packaged fruit sector – seems like a missed opportunity for lunch boxes etc. What should you be asking yourselves and your consumers if you are thinking of embracing the healthy food and drink for kids trend within your organisations NPD? Will consumers think badly of our existing product if we launch a new healthier one? Do we really need a new product to embrace the kids health trend or should we better communicate our existing products health credentials? Are the health credentials of the proposed and/or our existing product good enough? Which health benefits are most important to parents? 1/5 a day? sugar free? added omega 3? real/natural? 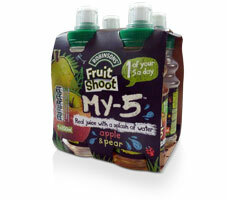 Can the product be reassuringly healthy for adults but still fun for children? 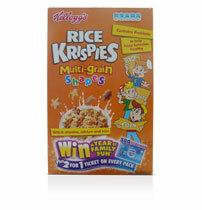 If we use cartoon characters on the pack will they feel too fun and funky and detract from the health message? Will parents see the use of cartoon characters as exploitative of their concerns or harmless and helpful in getting children to eat more fruit? Should we invest is using existing characters like super-heros who kids will aspire to for their energy and activity? Or should we invent our own characters that are less well known but we can take ownership for? Who are we really selling to? The child or the adult? What’s the right balance? Do meals need to feel more serious and worthy than say snacks and drinks? Would a celebrity (e.g. chef) endorsement add credibility or feel quite naff/gimmicky?